We had imagined that working on the Locost would be a good winter project. Now, we're not sure if anything that takes place at night in an unheated garage would be a good winter project. Not only is the garage cold, it's dark outside. Not very inviting. Progress is still being made, albeit slowly. We have 34 of 50 frame tubes completed, not counting around 20 transmission tunnel tubes, which are all small and simple and should be more manageable if not actually fun. We had imagined that our new table sander would make quick work of all those angled tube ends. It doesn't. Disappointing. It's okay on the shorter tubes, but the sanding platform is too tiny for anything much more than a foot long, so you have to try to hold the tube at the correct angle vertically, which doesn't always work out so well, which means in the end, you (and by "you" I mean me) have to go back and painstakingly hand file each end to the correct angle. In addition to cutting tubes, we also have a few more brackets to make before we start welding. We finished the seat belt brackets, which look from all angles as if anyone who spent much more than half an hour on each one is a complete idiot, which is why we won't be discussing how long they actually took, although we did record the time in our Microsoft Project file where it will be buried forever. Our remaining brackets include the steering rack and radiator mounts, plus a few simple flat pieces of metal for the brake lines and such. We're starting to wish we had a band saw. We cut all our metal pieces with a Dremel, which seems like it would take a long time but actually takes a lot longer. 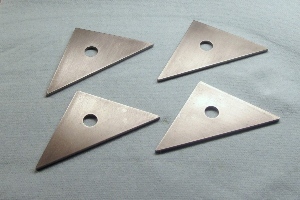 A few of the completed metal pieces have those telltale marks of an out-of-control Dremel skating across the surface. A cosmetic issue only, quickly forgotten once the pieces have been painted. At the hardware store the other day we saw angle grinders for about half the price of a Dremel. These things look like they'd cut through 1/8" steel quickly, if you knew what you were doing, or thought you might with a little practice. We didn't buy one. 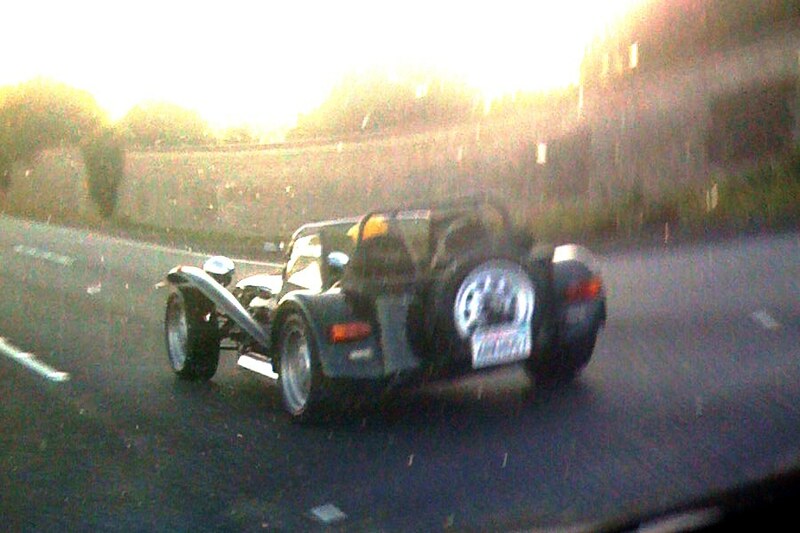 The exciting news this past week was a late afternoon sighting of an actual Caterham on the 101 southbound in San Rafael, right across from the Frank Lloyd Wright-designed Marin Civic Center, a.k.a. Gattaca (obscure reference to an excellent and highly-underrated sci-fi film). We snapped a photograph with our antique iPhone, however it didn't come out too well because we were headed directly into the sun, and it's an iPhone. 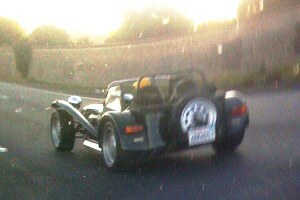 The Caterham was only going about 50 mph, and the side curtains were attached in a bizarre top-down/windows up fashion. The Caterham driver was a young man who couldn't have looked more terrified if he'd been on a skateboard. Traffic was heavy, and he was mostly invisible until you were right on him. When we spotted him we slowed way down to get a better look, then we paced alongside for a mile or more, which scattered traffic and might've freaked him out a little. But the car looked great. Some day that will be us. Without the side curtains. Hopefully without the look of terror.